Diamonds are a girl's best friend - and men quite like them too! Diamonds are traditional anniversary gifts for a 60th anniversary. In modern gift-giving traditions, diamond jewelry is also the gift for 30th and 10th anniversaries. Piglette features a selection of quality diamond anniversary gifts available from respected and reputed merchants. As a sign of affection or endearment no symbol is more prevalent than the heart. 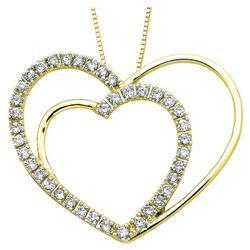 These breathtaking diamond heart pendants are crafted in 14 karat yellow gold. Piglette features a huge range of elegant styles for you to choose from. Brilliance only surpassed by the stars, this refined diamond pendant is an exceptional example of Elite Jewels' commitment to luxury. The hand set, round brilliant diamond is given ample room to shine within its 4-proned bail setting while the delicate addition of a 16 inch yellow gold curbed necklace provides the accurate drape to the feminine neckline. This beautiful diamond has an I1 Clarity and HI color. For diamonds she'll adore at values you can't ignore, Elite Jewels has everthing you need and more. Usually ships within 1-2 business days. Enjoy the finer things in life when you select these glorious diamond stud earrings. Highly polished 4-pronged white gold post and push-back settings cradle these brilliant round diamonds. These beautiful diamonds have an I1 Clarity and HI color. Each diamond is hand selected and hand set for perfect display. Ideal diamond anniversary gifts, your earrings will usually ship within 1 to 2 business days. Dynamic in every sense, this classic men's white gold ring combines stylish design with the ultimate in finishes. Spanning 9mm in width at its top and tapering to a 4mm apex, it proudly sports 4 round channel set diamonds with a 0.16tcw align vertically accros this rings highly polished face. Usually ships within 1-3 business days. Shining white gold is sleekly sculpted into an extraordinary arching frame for three pristinely radiant, prong-set round diamonds. This Diamond Anniversary Ring displays simply brilliant extravagance to honor the one you love. The center round weighs 0.30 ct along with two rounds weighing 1/5 ct tw. Three shining diamonds make a total diamond weight of 0.20 carats lighting up this sleek, modern pendant. The diamonds are set in a 4 claw setting with polished 14k gold. The 16 inch singapore style chain is included. Usually ships within 1-3 business days. Shining white gold is sleekly sculpted into an extraordinary arching frame for three pristinely radiant, prong-set round diamonds. Simple, brilliant extravagance to honor the one you love. The center round weighs 1/2 ct along with two round stones weighing 1/2 ct tw. This high class 14K gold round diamond channel set bracelet holds an impresive 3.85 total carat weight in diamonds. Bracelet measures 7" in length. Also available in white gold (not pictured). 30% off regular listed price. Please bookmark Piglette for diamond anniversary gifts plus a wide range of flowers and presents for all occasions. Read fascinating facts about the largest diamond in the world.